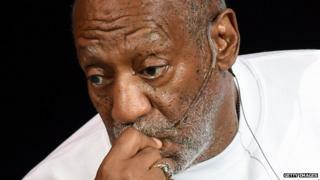 Two more Bill Cosby shows have been axed as the veteran comedian continues to face allegations of sexual assault. The Capitol Theatre in Washington State said Cosby's 29 November show had been postponed indefinitely. Foxwoods Resort Casino in Connecticut also said it had indefinitely postponed a performance by the 77-year-old, scheduled for 31 January. More than a dozen women have come forward in recent weeks to accuse Cosby of sexually assaulting them. The comedian has not directly addressed the accusations, but his lawyers have described them as "discredited" and "defamatory." The latest cancellations follow the axing of a concert due to take place in Las Vegas this week and five other dates in 2015. NBC announced last week it had shelved plans to revive Cosby's TV career, while repeats of his 1980s sitcom The Cosby Show have been pulled by cable station TV Land. Netflix has also decided not to broadcast a stand-up comedy special that was to have been streamed this week. Cosby performed a show in Florida last week and told a local paper he did not have to "answer to innuendos". The comedian is due to perform two shows on 6 December in Tarrytown, New York and has a string of other dates scheduled in 2015.